Vikings are one of the most interesting figures in history. Although they had a notorious reputation for being marauders and pillagers in the medieval times, they left remarkable things. Perhaps the most striking Viking achievement was their state of the art shipbuilding and their entertaining Norse mythology. Norse mythology is incredibly rich and full of many great stories from Odin to Frigg, Thor, Loki and many more. With this, you will see movies with references from Norse mythology like The Vikings, Thor, and other Marvel movies. 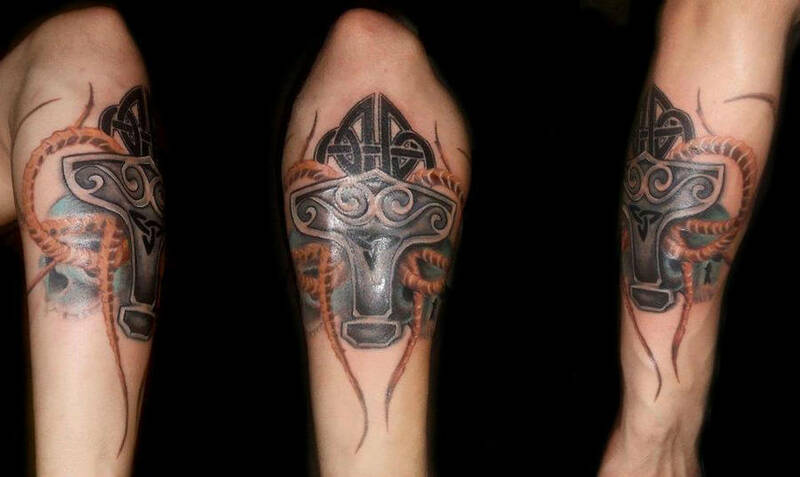 To show your love of Vikings, you decided to have a tattoo. If you are a fan of Thor, it is hard to miss Mjolnir or his hammer. The Mjolnir is depicted in the mythology as one of the most powerful weapons in existence – it is so powerful that it is capable of leveling mountains. In the mythology, dwarven brothers Sindri and Brokkr crafted the hammer. The Mjolnir is characterised by a short handle. This is due to a mistake during its creation. You can consider Mjolnir tattoo if you want to emanate power and authority. Thor is also the protector of mankind so having this tattoo depicts protection. The Gungnir is also called the magical spear of Odin. In Norse mythology, it is called the spear of heaven. You can also consider the Helm of Awe. It is a symbol of might and protection. Surrounding the Helm are different symbols like the R-shaped horse symbol and R-shaped ride symbol next to it. The Vegvisir is considered the compass of the Vikings. This is meant to guide them through the storm and other bad weather. The compass is made of eight rune staves. Essentially, it is the symbol of guidance and protection. Having this tattoo will remind you not to lose your path in life. The Valknut is characterised by three interlocking triangles. It is an enigmatic symbol because it appears on different objects but there is no unified meaning. There are many theories but the most prominent one is that the Valknut is connected to Odin. It is believed that this means he could loosen the tensions of fear during battle. This describes three interlocking drinking horns. The Horn symbolises Odin. This also refers to the symbol of wisdom. In Norse mythology, Valkyrie means “chooser of the slain”. They are often depicted as beautiful maidens attendant upon Odin. Their role is to bring the souls of slain warriors chosen by Odin to Valhalla. The Troll Cross is the Viking symbol for protection. It is characterised by a bent piece of iron worn as an amulet. In the past, people use this for protection against trolls and black magic. Yggdrasil is considered the tree of life. According to the Norse mythology, Yggdrasil is a huge tree that connects the nine realms. It is also the thing that holds the worlds together. It is basically the spine of all existence.